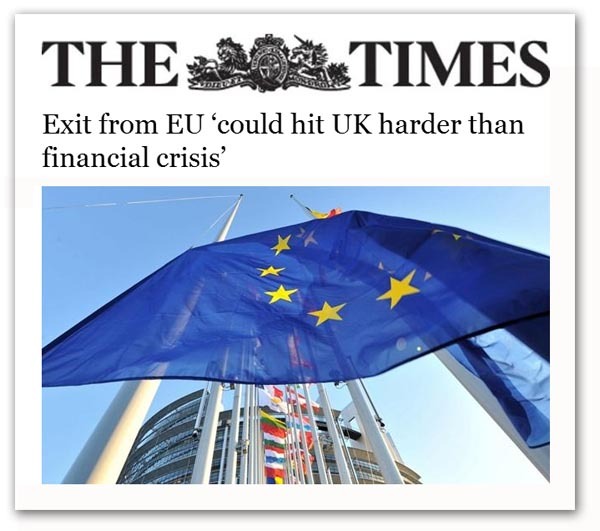 In The Times and others we have a review of a paper from the LSE's Centre for Economic Performance (CEP) claiming that a decision by Britain to leave the European Union "would be a risky gamble" that "could result in economic losses larger than those suffered at the time of the global financial crisis". This, though, is a "worst-case scenario", the nature of which is unspecified in any of the newspaper reports. All we get is that Britain could suffer a fall of up to 9.5 percent of GDP, compared with the seven percent drop in output after the global financial crisis struck. Only when we get to read the report do we see that the scenario on offer is that the UK leaves the EU and joins EFTA (but not the EEA, which is not mentioned). On the basis that EU members trade substantially more with other EU countries than they do with members of EFTA, the CEP estimates that our trade with the EU will fall by about a quarter. Combining this with the estimates that a one percent decline in trade reduces income by between 0.5 and 0.75 percent, that "implies that leaving the EU (and joining EFTA) will reduce UK income by between 6.3 and 9.5 percent". That could be equivalent to a cash loss of £50 billion. Then, even at the very best, CEP projects a "optimistic" case that would result in a 2.2 per cent fall in GDP, equivalent to a "substantial" £18 billion loss. The base assumptions here, though, are fundamentally flawed, not least because the "research" does not distinguish between EEA and non-EEA members. It appears to make the same assumptions for both. Then, while it is true that EU-EFTA trade rates are lower, this is to a very great extent due to the fact that the three main EFTA economies are very different from those in the EU, not least in terms of their protectionist attitude to agriculture – trade in which is excluded from their deals. In the UK, however, we operate very open trade in agriculture and food (including drink and animal feed). Furthermore, this is a sector that exported about £18.2bn in 2012 of which about £9.5bn went to EU countries. By contrast, the UK imported in the same year £37.6bn, of which more than £25bn came from the EU. With a near 3:1 disparity between import and export, therefore, the UK is in a powerful position. One might expect it to be able to cut a deal with the EU, based on current trading terms. Similar dynamics apply to other sectors, which means that the CEP projections, based on existing EFTA arrangements, are simply not realistic. Their supposed losses are scaremongering. Given our trade scenario (with version 11 now available), the "Norway option" would be economically neutral. Trading arrangements would carry over unchanged and there would be no measurable losses. This, however, does not stop the CEP plunging in the dagger, claiming that the "dream of splendid isolation may turn out to be a very costly one indeed". This is typical Europhile scare phrasing, tedious and predictable. What worries, of course, is the facility with which the media trot out this low grade speculation, without the first attempt at critical analysis. In any referendum campaign, we're going to see an awful lot of this and a confused and worried public could easily be swayed by this sort of nonsense. The antidote, of course, is to keep pushing our own analysis – Brexit will be economically neutral, leaving us open to enjoy improved democracy and the other benefits of withdrawal. The trouble is that there are plenty CEPs and no end of scary stories, so we must not allow the battle to be fought on economic grounds.